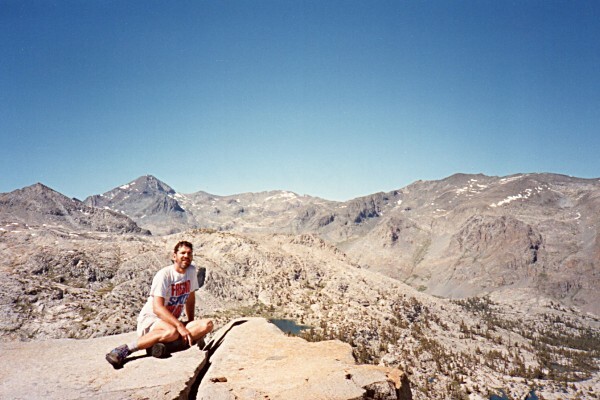 In my fourth year of hiking in the Sierra since returning to California, I became more interested in going off trail. 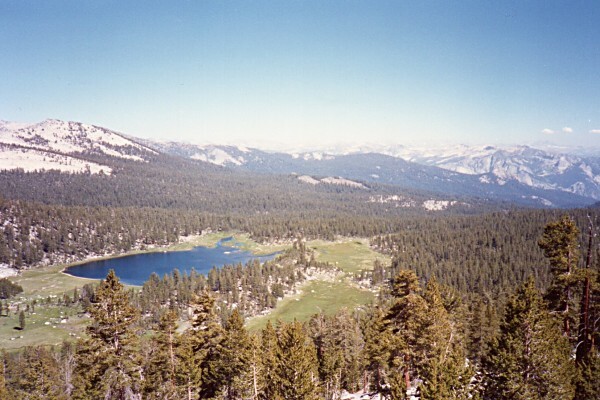 This hike was inspired by Trip 37 in Sierra South but differs from it in a few details. I picked up my wilderness permit at the Dinkey Creek Ranger Station and was at the Woodchuck Trailhead near Wishon Reservoir by 8:40. I crossed Woodchuck Creek at 10:30. I met a lot of groups on their way out in this popular area which is called Woodchuck Country. I arrived at Crown Pass at 3:50 and took several photos from this fine view point. Crown Lake from Crown Pass - The views from Crown Pass, which looks more like a hill than a pass, are quite lovely. It was a beautiful, cloudless day. I set up camp at Halfmoon Lake and was entertained by small trout jumping for their dinner while I ate mine. I was the only occupant of the lake that night. I was up early the next morning and on the trail before seven. By 8:30, I had arrived at the North Fork of the Kings River. A couple of hours later I was in the Blackcap Basin near the Crown Basin trail junction. Crown Basin Trail Junction, Blackcap Basin - This spur of Finger Peak makes a perfect backdrop for the meadow next to the Crown Basin Trail Junction. I squeezed off a shot of Blackcap Mountain. Blackcap Mountain does not look like much from here or from anywhere in this part of the basin. I stopped next to Portal Lake where I saw the beginnings of the cross country portion of the trip. 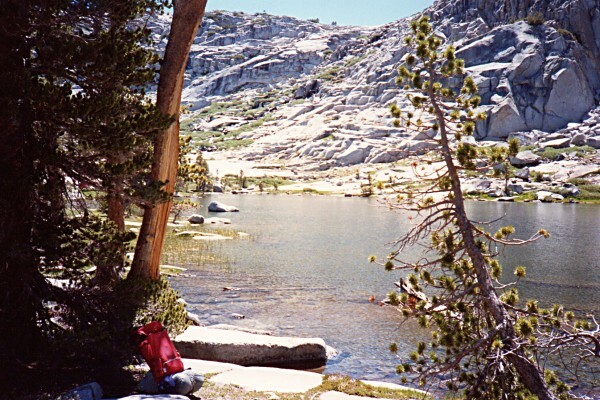 Portal Lake is a popular camping spot. It is also the portal to beautiful lakes upstream from it. Cathedral Lake from Finger Pass - This is the view of Blackcap Basin from Finger Pass and shows just a few of the many lakes of the area. 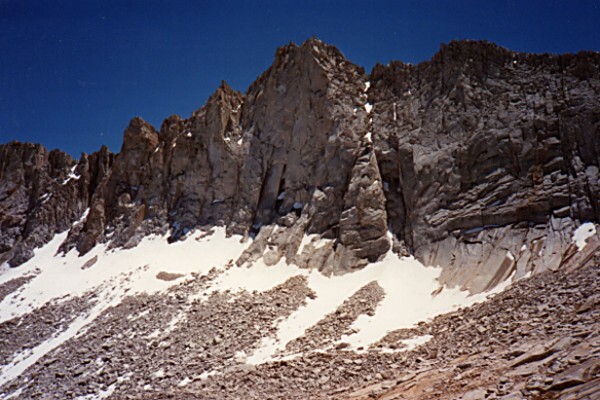 and the north face of Finger Peak from Finger Pass. North Face of Finger Peak - Although I planned on bagging Finger Peak during this trip, the climb had to wait until a later trip due to time constraints (read: I took one look at that sucker from the south and said, "No way is that class 2.") 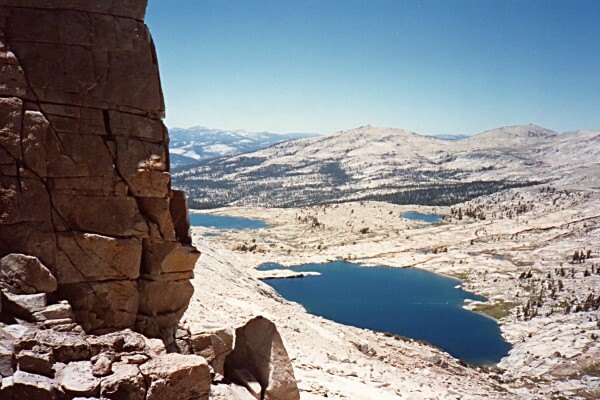 I found out a couple of years later that it is an easy class 2 from Blue Canyon Pass as it must be from the south. The hike from Finger Pass to Blue Canyon Pass was mostly across large talus. Finger Pass is just as distinctive from the east side as from the west. I reached Blue Canyon Pass at 3:40 and enjoyed the views of Mt Goddard country to the north and Blue Canyon to the south. North from Blue Canyon Pass - On a beautiful day, there was a great view to the north. Mt Goddard is the dark giant above the resting hiker. One of the many lakes along the west fork of Goddard Creek is visible in the lower right corner. At a little before six, I arrived at the lowest large lake in Blue Canyon basin and found a camp spot nearby. I was glad to get off my feet which were sore from crossing the sharp talus. The next day was devoted to exploring Blue Canyon. It took a while to melt the night's frost off of my gear but I was on the trail at a little after eight. I spent a some time casting for trout in a lovely lake but could find none interested in what I had to offer. 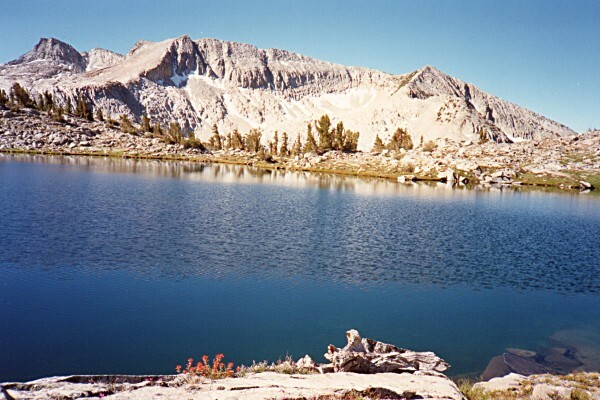 Lake of the Blue Canyon Basin - There are few people in the headwaters of Blue Canyon and you can see it is not because it lacks beauty. The cross country part of the trip ended in mid-morning as I found trail just below the lakes and followed it down the canyon. Pool in the Creak of Blue Canyon - Here's a beautiful pool to soak your feet in. 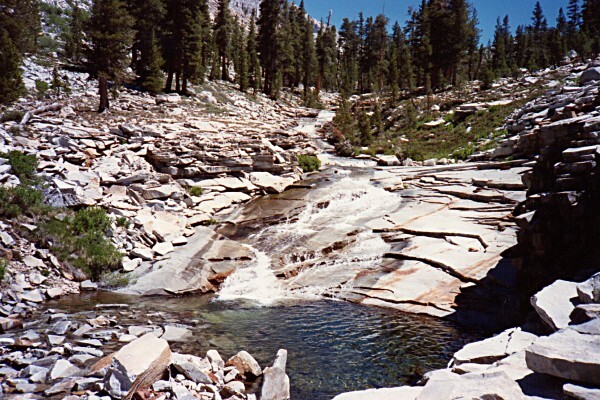 Much of the stream flows on smooth rock in a series of water slides. 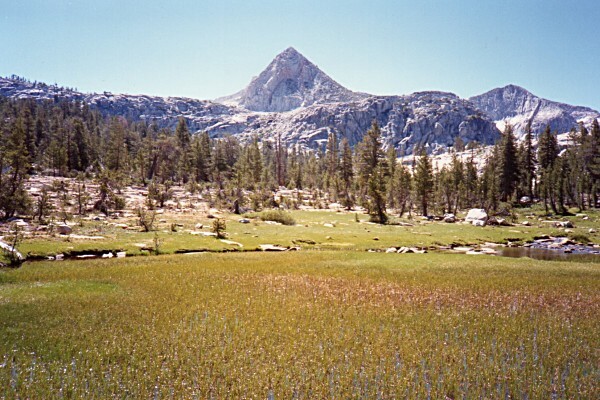 Around mid-day, I arrived at the large meadow below Coyote Pass. 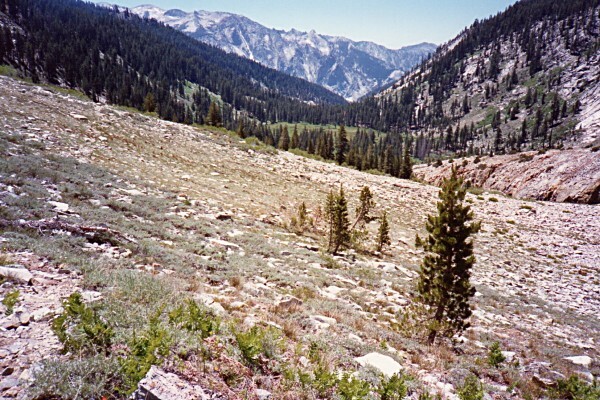 Blue Canyon Meadow - The large meadow in the center of the photo is one of the finest in the range. The south canyon wall of the Middle Fork of the Kings River forms an impressive backdrop. At the base of the meadow, I dried my feet, explored the abandoned cabin, and found the blazes that mark the beginning of the infamous Tunemah "Trail." 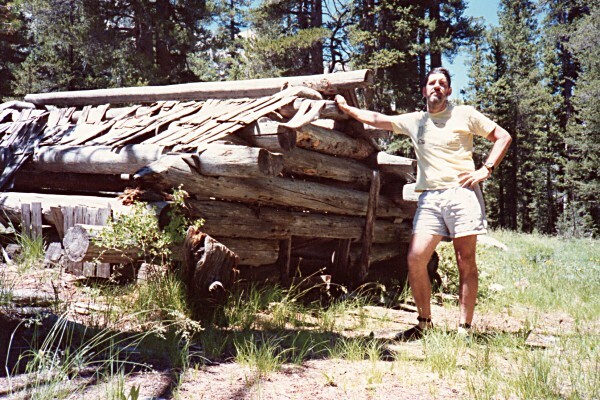 Cabin in Blue Canyon Meadow - This decaying cabin is strategically placed at the base of the meadow and at the Tunemah Trail junction. 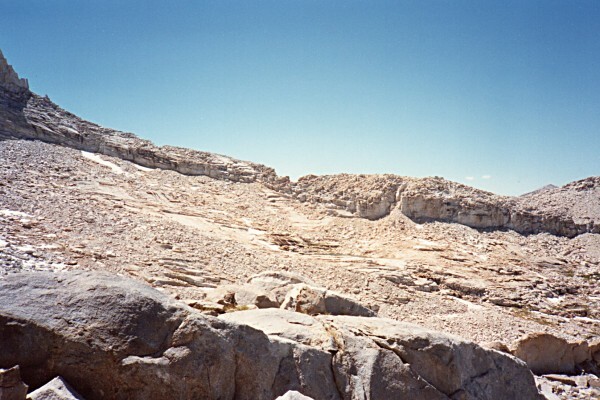 At around four, I began climbing the poorly planned trail up Kettle Ridge. Trails in this area were originally built for stock and seem to follow the path that the first sheep took. It must have been a demented sheep at that. At around six, I met the Simpson Meadow Ranger. She was exploring the area so she could prepare a report addressing the effects of a proposed $4 million trail from Pine Flat to Tehipite Valley. 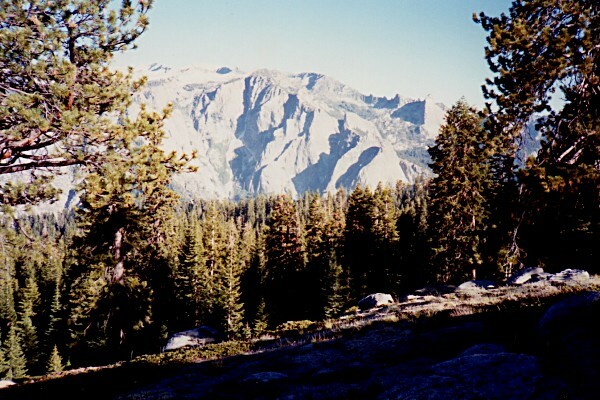 (Thank God and probably the Sierra Club, the trail has not been built.) I camped on the north rim of Kings Canyon (Middle Fork). I had to search for water in this very dry area but found some about 20 minutes from my campsite. After a great meal, I enjoyed the fantastic views from my perch at canyon's edge. North Canyon Wall - There were impressive views of the wall on the other side of the Middle Fork of the Kings River. A fearless doe walked through my camp as I was preparing for bed. The final day started under beautifully clear skies. I got an early start and made my way past Kettle Dome. Kettle Dome shines in the morning light and dominates the scenery at this elevation of the area. 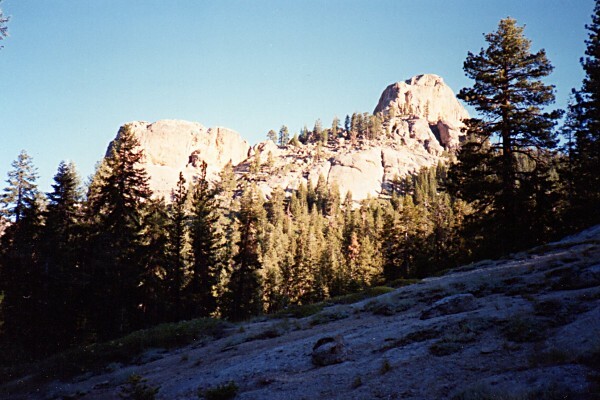 Its cousin, Tehipite Dome, is lower than the elevation of the trail and you have to work to see it. 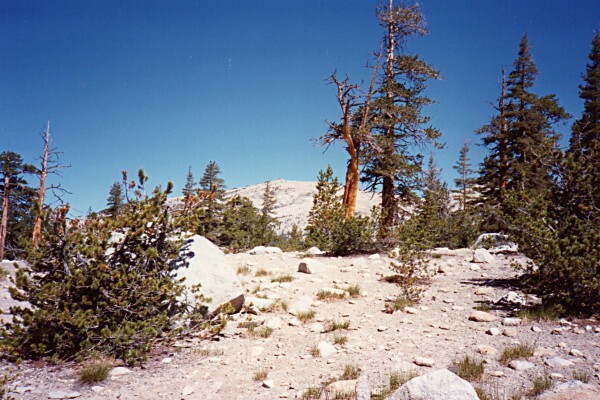 A little after ten, I arrived at the Crown Pass trail junction. I headed north and arrived at the Chuck Pass trail junction at 1:30. A little less than an hour later, I crossed Chuck Pass. 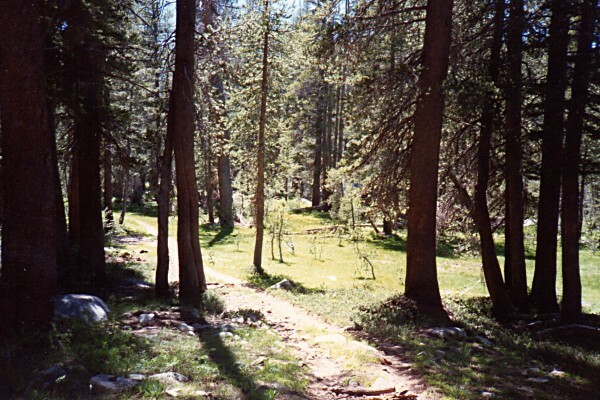 One of many meadows broke up the monotony of the mostly forested trekking. Meadow of Woodchuck Country - This is one of many lovely meadows along the trail that returns to Wishon Reservoir. I walked by Indian Springs at 3:30 and passed by cabin ruins just before arriving at the Finger Rock Trail at 4:20. Twenty minutes later I had closed the loop. I arrived back at the trailhead a little before eight. The only other people I saw all day long were during the last few hours of the trip on the heavily traveled Crown Pass trail.